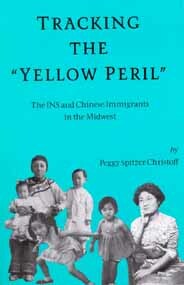 Tracking the "Yellow Peril", published by Picton Press, is a guide to the vast amount of documents kept by the federal government on Chinese immigrants to the United States during the era of the Chinese Exclusion Acts, from 1882 to 1943. The author, Peggy Spitzer Christoff, has a doctorate in international relations with a specialty in Chinese politics from American University in Washington, D.C., and now works as a consultant with the John W. Kluge Center at the Library of Congress. She introduces the reader to the disgusting anti-Chinese policies implemented by the U.S. government during the exclusion era and to the strategies adopted by Chinese immigrants to evade those legal obstacles and get themselves and their families into the United States. Another goal of her book is to suggest several themes for future study. As an introduction, Tracking the "Yellow Peril" is invaluable. As a font of suggestions for research topics, it is a bit annoying -- but this may be a quirk of mine since I never like being told to do something, or feeling like I am being told to do something. Now that I have shared one of my pet peeves, I will dispense with my nattering nabob of negativity hat and move on to the important stuff. The book is divided into six sections, a prologue discussing the development of Chinese Exclusion policies and their implementation by the various precursors of today's Immigration and Naturalization Service, followed by five parts. Part One, "Exclusion of Chinese in the Midwest" describes in detail Chinese family structure and the immigration strategies implemented by families, women, students, professionals and public charges in an effort to circumvent U.S. efforts to keep the Chinese out. Part Two contains indexes that enable genealogists and scholars to track down records of Chinese immigrants in the National Archives' Chinese Exclusion Case Files. The next two parts contain a discussion of the National Archives' role in keeping the case files, and one of women in the case files. The final part is invaluable -- in it is found images of sample documents. Throughout, Christoff focuses on 23 prominent Chinese families in the Midwest at that time. Her focus on specific cases is a boon to researchers trying to visualize how to take advantage of this vast trove of research material. Exclusion was a national, not a regional, phenomenon. Even if the researcher's focus is on Chinese that avoided the interior of the continent during that time period, Christoff's book will still prove an important source. Tracking the "Yellow Peril" is not meant to be read as a diversion, but to be read with a specific purpose in mind. It is an essential guide for anyone researching Chinese-American families during the dark decades of the exclusion era.